The Museum of Považie Region in Žilina has involved the research of tinkery into its activities from the beginning of its existence in 1942. Contemporary tinkery masters had made large wire sculptures of people, animals, fairy-tale creatures and models of vehicles for the initial exhibition which presented the tinkery craft as an art. 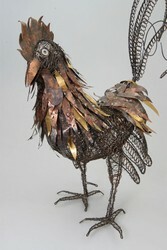 A wire rooster on a tower stand by master Kerak dominated the sculptures. The rooster was, for the first time, made in wire and the Museum of Považie Region decided to have the rooster as their logo in 1990. A rooster has become the principal theme of creative project Kohútik jarabý/Spotted rooster. The project have inspired 48 authors of all ages from Slovakia and the Czech Republic who have prepared 70+ exhibits. Sculptures dominate the collection diverse in genres and styles. Craftsmen have decided for traditional tinkery techniques as well as author-specific techniques. They have used all types of wire and sheet metal from steel and non-ferrous metal, often with various surface finishes. They have also added paper, wood, feathers, stones, gemstones, pearls, beads and buttons. The Museum of Považie Region has prepared the exhibition in collaboration with the Municipality of Žilina to be one of the events at the Tinkery festival 2012.